I have put my hair through torture over the last few months, between the usual thrice weekly blowouts and that day that I decided to cover it in a permanent level 5G (it would have been a lovely golden brown - if it had not been white blonde before...), so anything I can do to relieve it of its stress I will do. So far that has meant expensive conditioners, costly hairbands and monthly trims. So you can imagine my amazement when I came across the RickyCare No-Frizz Oil Comb. 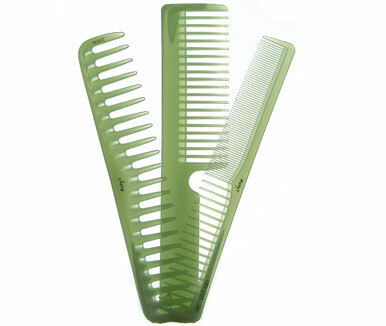 Not only was I amazed that someone had managed to make a comb that helps to tame frizz, but said comb is only $5.99. It is like they are giving this thing away. Ricky Kenig of http://www.rickycare.com/ had managed to bake Turkish olive oil into green plastic combs. When you brush the comb through dry hair, a very small amount of the olive is distributed on the hair shaft, leaving it soft and shiny. I am so thankful that these combs come several different sizes as well, so you can keep one in your bathroom and 5 or 6 in your purse.. I have a comb that's infused with macadamia nut oil...I LOVE it! It does work very well. Question, has anyone tried washing it, and was it still effective? I rinse it with warm water and shampoo and I don't think that it has hurt it!